Design with the ability to create infinite borders. This easy-to-install modular system can be used in a variety of applications for your unique design-intent. This modular, 3-dimensional product is created with CNC machining and advanced thermoforming capabilities. Specify Profile panels and tiles in 18 wraps or finish on-site with primer and paint. 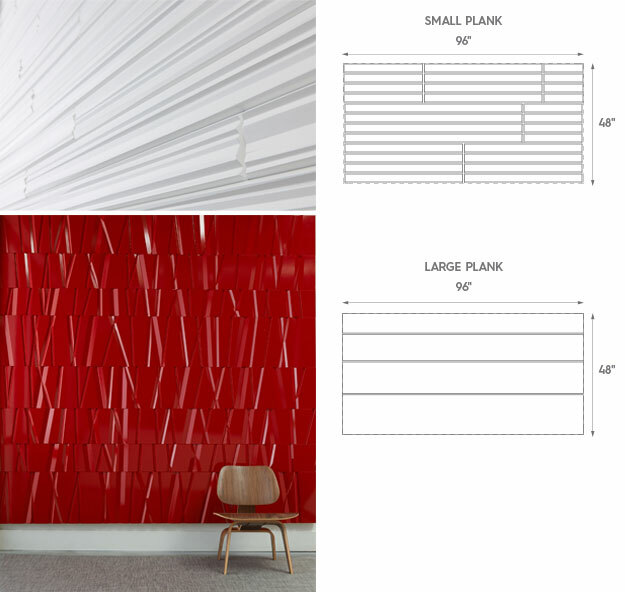 Profile Tiles are 15.5" x 3.5" to 4.62"
Profile Tiles easily integrate with 3form Chroma to bring striking accents to textural wall installations. Using the C3 Color Matching System designers have access to 10,000+ colors to brand corporate spaces or beautify heathcare spaces. Note: While the surface of Profile Tiles feature carved dimension the surface of Chroma tiles is flat. Chroma tile edge details also vary from Profile tiles. For Profile tiles a preferred method of installation is to use 3M VHB tape to apply and hold the tiles to the wall. Begin by installing the bottom row of tiles; ensure the alignment is level so the following rows will align accordingly. 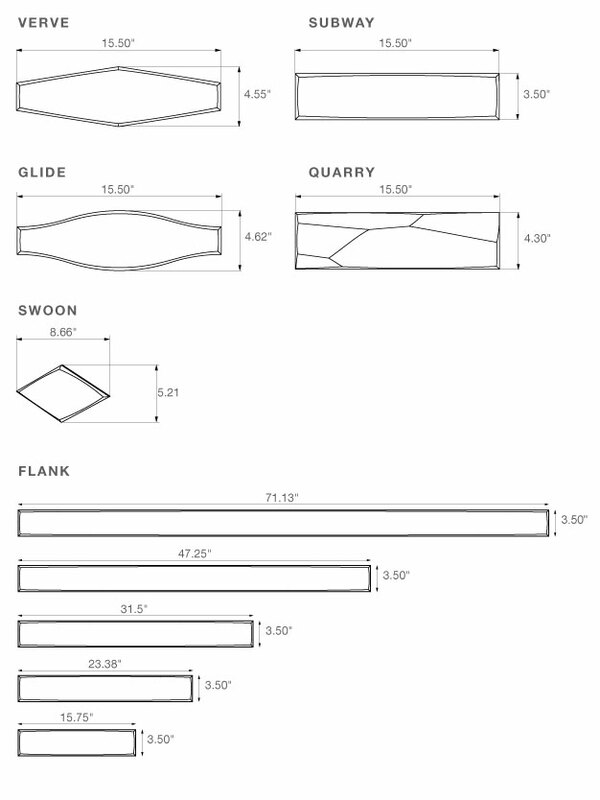 Profile Panels are 48" x 96" and can be ordered in either pattern direction. Profile is available in 4 Transition options for each pattern and direction selected. 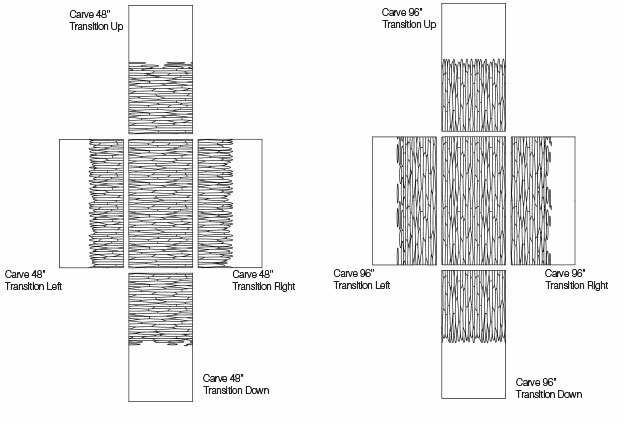 As an example, the following figures show the four options for Carve in the 48” direction and the 96” direction. Profile is also available in two separate Plank options. All of the unique Profile texture options are available in Small Plank and Large Plank. Each piece is individually cut and wrapped. The sizes are listed in the following table. 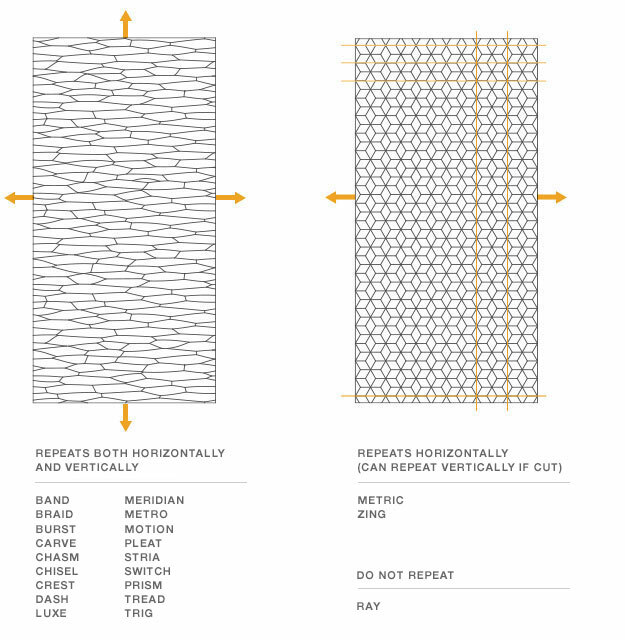 All Profile Panels can be repeated in either an omni-directional or uni-directional repeated pattern for continuous textural applications. 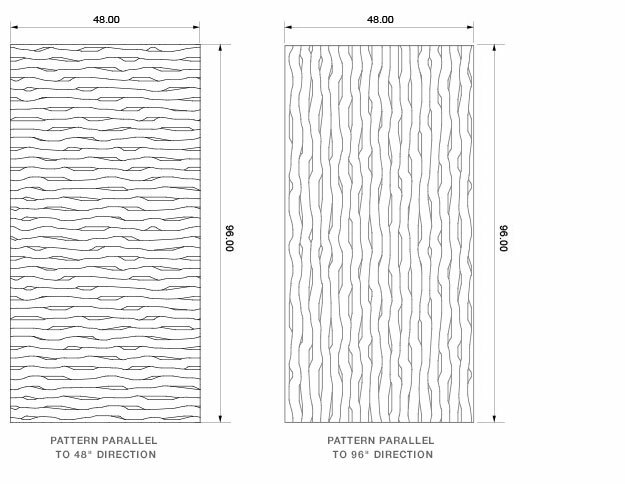 An omni-directional repeating pattern will allow for unlimited project areas. Identical panels may be used to extend the pattern in any direction. Patterns fit together top side to bottom side and left side to right side. The orientation of the pattern must stay constant in order for the panels to repeat. Some of these patterns can be cut and still remain as omni-directional patterns. A uni-directional repeating pattern can only be used to fill an area in the horizontal direction. Identical panels may be used to extend the pattern parallel to the 4’ side. Patterns fit together left side to right side only. The orientation of the pattern must stay constant in order for the panels to repeat. The pattern can extend vertically only if they are cut along the dashed lines above. There are a variety of possible ways of installing 3form profile panels. Below are common installation methods. To install Profile panels to the wall using Z-clips, first Z-clips must be attached to the back of the Profile panel. Z-clips should run the entire width of the panel. A minimum of (3) rows of Z-clips are necessary per 8’ tall panel. Rows of Z-clips should be situated on the top and bottom edge of the panel, with additional rows spaced evenly between. Plywood or solid wood “in-wall” blocking is required. French Cleats would be installed in the same way as the Z-clips. Profile wall panels can be attached to a wall by screwing directly through the panel. Construction mastic should also be used to supplement the screws. This technique should only be used on non-wrapped panels that will be painted in the field. Holes in the panel should be pre-drilled and counter-sunk. After screwing the panel to the wall a non-shrinking filler like Bondo may be used to cover the holes. Please note that non-shrinking filler should not be used between panels. A flexible seam filler should be used in between panels. An industrial grade mastic such as “Liquid Nails” or “PL Premium Polyurethane” can be applied to the back of the panels and then pressed onto wall treated with 1/2” Plywood. Construction mastic should not be used in conjunction with drywall. Panels must be clamped or held in place until the mastic is fully cured. A preferred method is to use 3M VHB tape to apply and hold the panels to the wall while the mastic cures. Alignment of the panels prior to curing is important as the panels may not be re-aligned after curing.